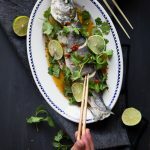 Whole fish is steamed and then dressed in Thai-inspired sweet, tangy, savory, and spicy dressing. Totally delicious and easy. Most of the time the internal parts have been removed, but some are not, especially if you buy them from Asian market. You can have them removed for you. You may need to do the "scaling" on your own. Use a knife and scrap the scales off the meat by going on the opposite direction of the scales. It may be messy, as the scales may "fly" all over the places. I recommend getting a clean trash bag big enough for you to do the scaling inside the bag, so the scales will not go anywhere else and you don't have to worry that they will go down your kitchen sink.